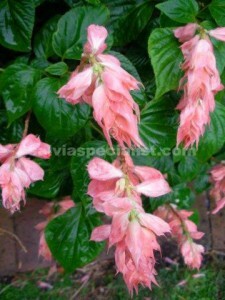 Splendens is the salvia species which was notable in public gardens last century. At that time it was bright scarlet and about 80cm high. 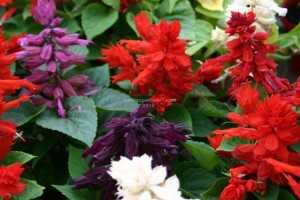 Now it has been bred to be purple or cream as well as red and in various heights. We have a plant which is said to be the original species, red and to 2m high. It will flower year round if you don’t have frost. There is also a beautiful salmon pink 2m variety. The origins of van Houttii have got lost over time but it is like splendens in a very popular wine colour. There are also many other local variations especially from tropical areas. Sold in Queensland are lots of colour variations with variegated spotty leaves. I think the variegation is due to a fungus or something (correct me if I am wrong) and doesn’t appeal to me. If you want to order van Houttii go to that page please. ‘Alan’s Maroon’ seems a slightly better variation of van Houttii. It is very hard to tell the difference. I used to get it and then get confused and lose track of it. These days I usually propagate ‘Alan’s maroon’. Splendens is very accommodating because it doesn’t mind shade or sun. If you have frost you can grow it under a tree if you are not much colder than -2C. Splendens red and salmon pink should be available in summer 2016 but now in wintertime it is out of stock.